Michael Colleran says 4,000 to 5,000 9-3s will arrive this model year. DETROIT -- Over a light breakfast of watermelon, Danishes and orange juice, at a country club 15 miles north of Detroit, Victor Muller exudes an optimism that is as healthy as his to-do list. His company's purchase of Saab from General Motors Co. is nearly 90 days old. There are vehicles to develop, a global distribution network to create and advertising messages that must cleanse Saab of the stench of death. The laundry list is a kilometer long. But Muller, CEO of Spyker Cars N.V. and new boss of Saab, is near-giddy at the thought of getting his hands on this once-strong brand. He recalls the moment, at the Geneva auto show in 2006, when he saw the concept Saab Aero-X. "I will never forget what an incredible impact that car had on me," Muller says with a grin. "I thought it was one of the best designs I had seen in a decade." Four years later, Muller sits at a table with a handful of journalists and explains why Spyker buying Saab was "a dream come true." The tiny Dutch company, known for building low-volume, high-performance sports cars, spent $74 million to buy a company worth $1.1 billion -- and got several vehicle programs to boot. Basically, says Muller, it was "a no-brainer." With the help of European investment banks and the Swedish government, the company has a loan of nearly $550 million to draw upon. Muller's Saab also has a state-of-the-art assembly plant and engineering center in Trollhattan, Sweden, including a crash laboratory, wind tunnel and climate chamber. "You name it, we got it," says Jan Ake Jonsson, CEO of Saab Automobile AB and a holdover from the GM days. But the challenge for the new Saab is staggering. It needs to cut losses, break even as an independent automaker and build confidence in the brand -- all while selling GM-developed projects for two more years. The first test comes in two months with the launch of the redesigned 9-5 sedan, followed by the wagon next year. The 9-5 was developed on GM's global mid-sized vehicle platform, the same platform shared with the Chevrolet Malibu, Buick LaCrosse, Opel Insignia and other vehicles. And the GM link continues next April when the 9-4X crossover -- "a sister vehicle to the Cadillac SRX," says Jonsson -- goes into production at a GM assembly plant in Mexico. This is Saab's first crossover, and it will be the only vehicle not assembled by Saab. In 2012, the next-generation 9-3 debuts -- developed by Saab, although much of the styling was locked in under GM's ownership. Muller maintains it will be the first Saab with his stamp. "We are going to make the 9-3 into a car which will be even more Saab-ish, if I may say so," he says. "We will take the design one step up." Then there's another vehicle on Saab's wish list: a car smaller than the 9-3. It is talked about but not currently in the business plan. Another key to Saab's global success is reducing its breakeven point. Says Jonsson: "We are probably today a little bit north of 100,000 cars in terms of breakeven. By 2012, it is our ambition to be down at the 80,000, 85,000 level." That means that if Saab can sell 120,000 cars per year, "we will have a good return on the business," he says. Over the past decade, Saab has been near that level five or six times. "So it is not an unrealistic expectation," Jonsson says. This year the goal is 50,000 to 55,000 vehicles. Of that number, 15,000 are aimed for the United States. Production resumed just eight weeks ago, and the global distribution network is still being developed. Michael Colleran, COO of Saab Cars North America, expects 2,500 9-3s to be on the ground by mid-June. A total of 4,000 to 5,000 9-3s are expected to be imported for the 2010 model year. "We took an extra 1,000 units on top of the units that we were already allocated," Colleran says. "We have the demand from our dealers." 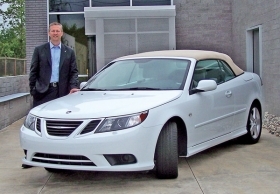 Saab is thankful to be free of GM and still be in business. The downside of being a part of a big company, says Colleran, is that "you have to fight for product priority. You have to fight for share of mind, and that is something that we really suffered." He says that became apparent when "you [saw] a 13-year-old 9-5 going down the assembly line." Unshackled, reborn, rejuvenated, the new Saab is rolling, fueled by a single focus. Says Muller: "We are very optimistic we will pull this one off."